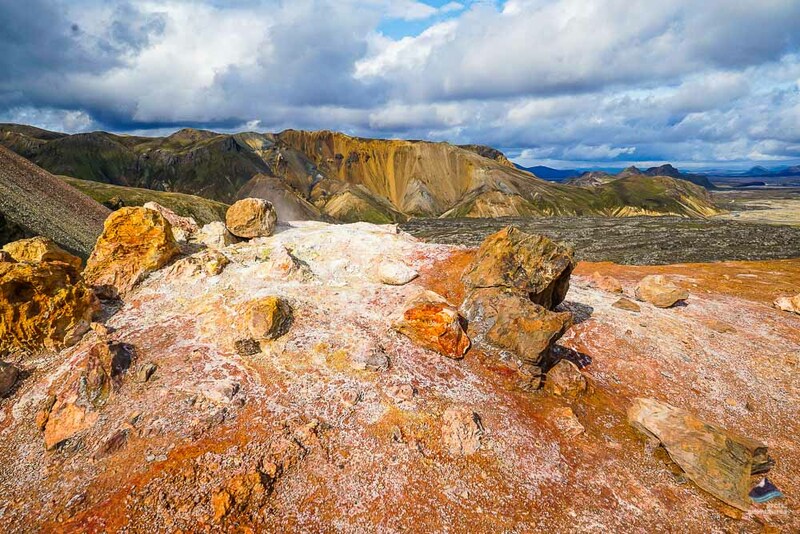 Landmannalaugar is situated centrally in the colorful rhyolite mountains of Fjallabak Nature Reserve. 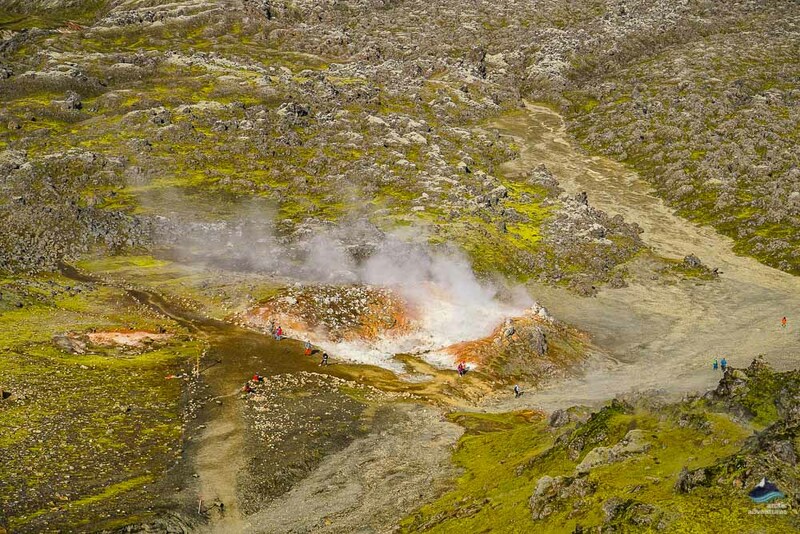 It is a true nature gem filled with geothermal wonderments. 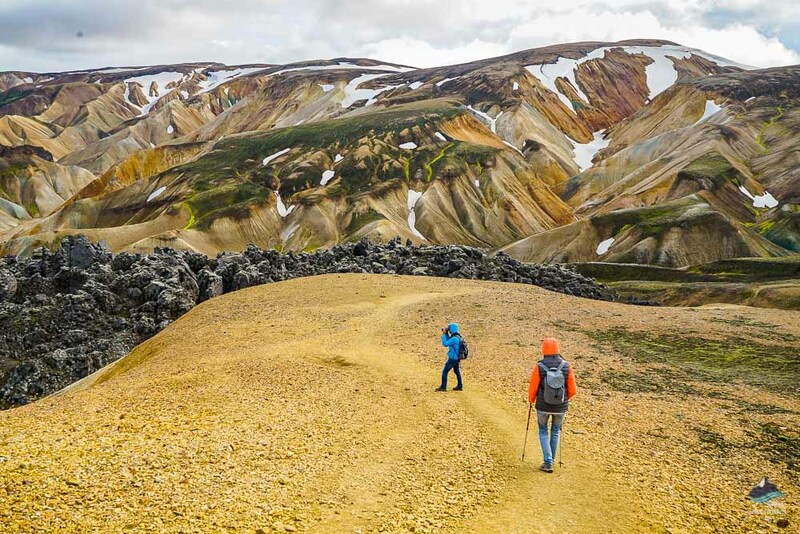 Landmannalaugar is the most common starting point for the famous Laugavegur Trek and is for many an absolute favorite location in Iceland. 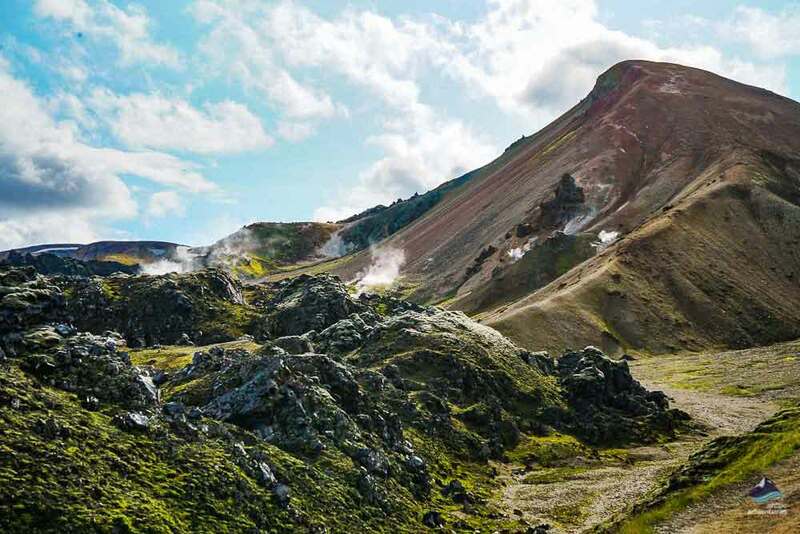 This geothermal utopia is known for its natural hot spring, vibrant mountains and for having some of the best hiking trails found in Iceland. 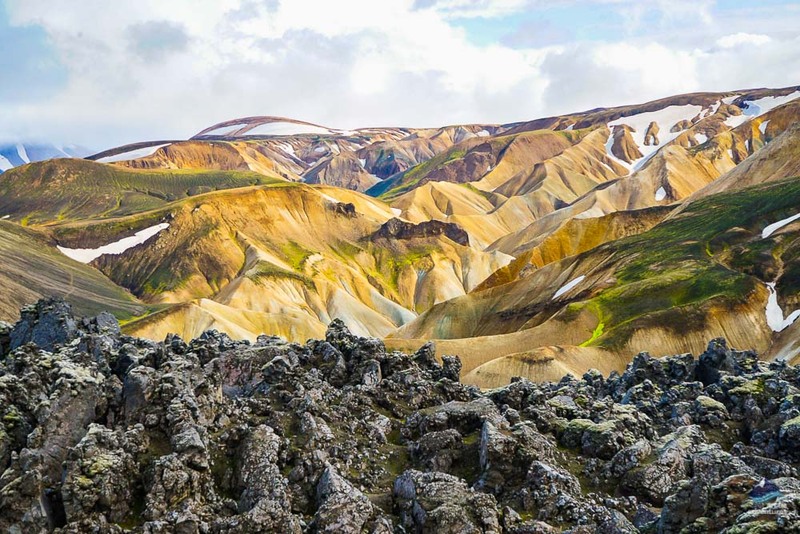 Landmannalaugar is both a geothermal and an aesthetical wonderland in Iceland’s southern highlands with soothing hot springs, soft caramel, and brightly colored peaks, steam rising from the ground, clear blue lakes and hot pools. 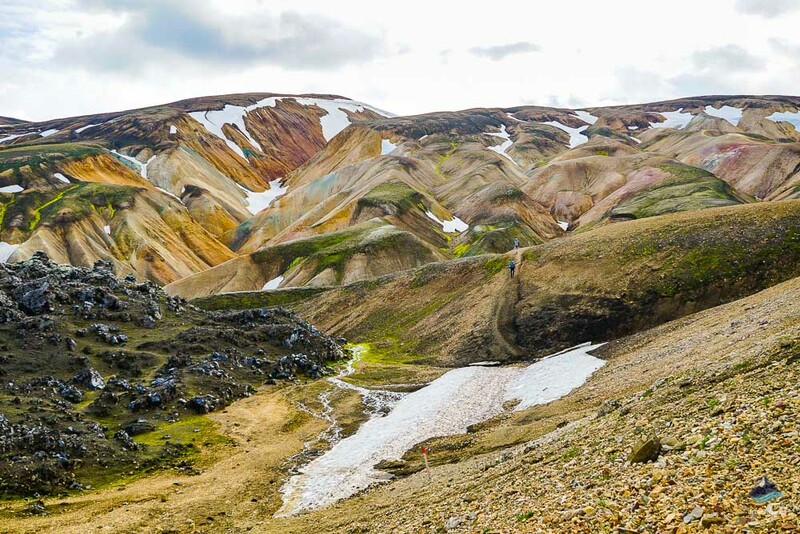 Landmannalaugar means the peoples’ pools taking its name from the unique hot spring pools that have warmed up Icelanders for centuries. 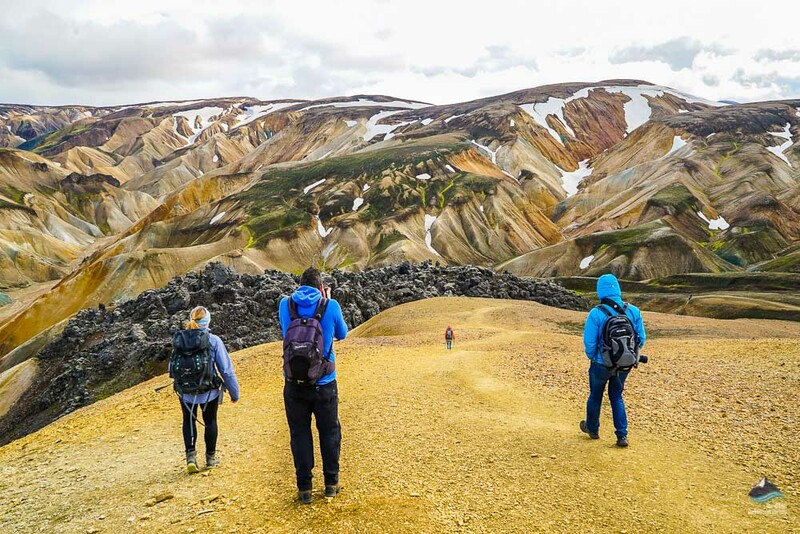 You can visit all year round but the most popular time is in summer when you can take anything from a day trip to Landmannalaugar up to an 8-day highland hiking expedition. 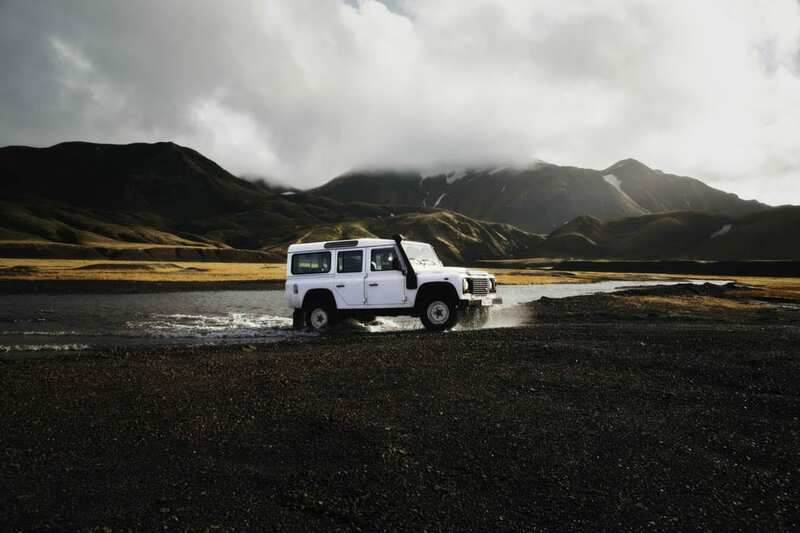 During wintertime, you will need to join a Super Jeep tour to visit but during wintertime, the area of Landmannalaugar is known for incredible Northern Lights. Possibly treating you to a show in complete serenity away from any city lights giving the auroras the best conditions to shine. 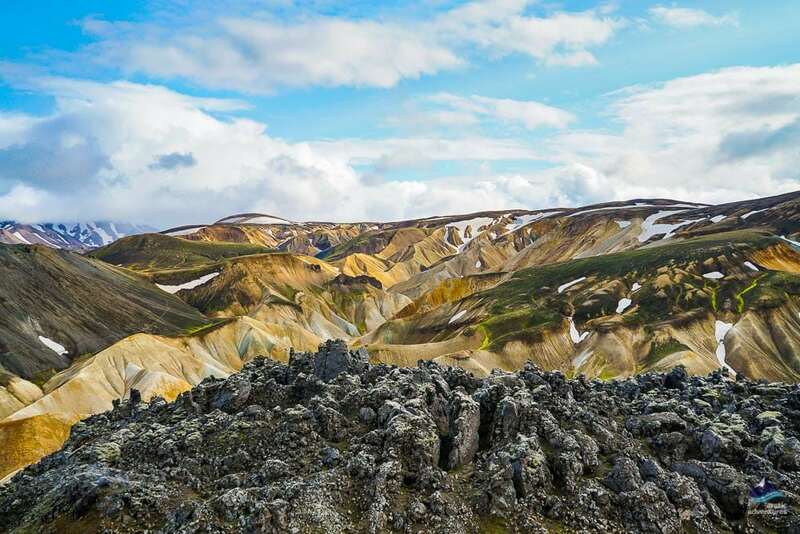 Arriving in Landmannalaugar you will see an array of colorful mountains, ranging from green to blue to black, yellow and even pink. 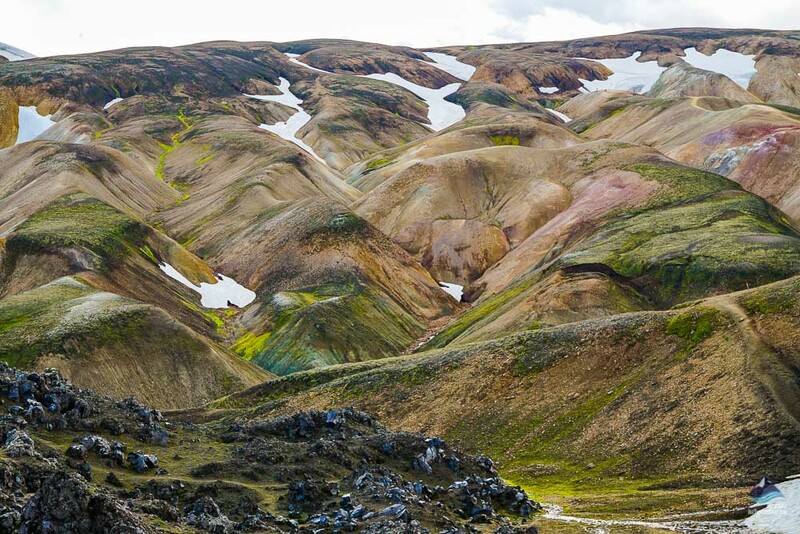 These colors are completely natural spawn from the geothermal and volcanic activity found in the area and to hike amongst is to experience the sheer vastness of this raw and absolutely magnificent place. 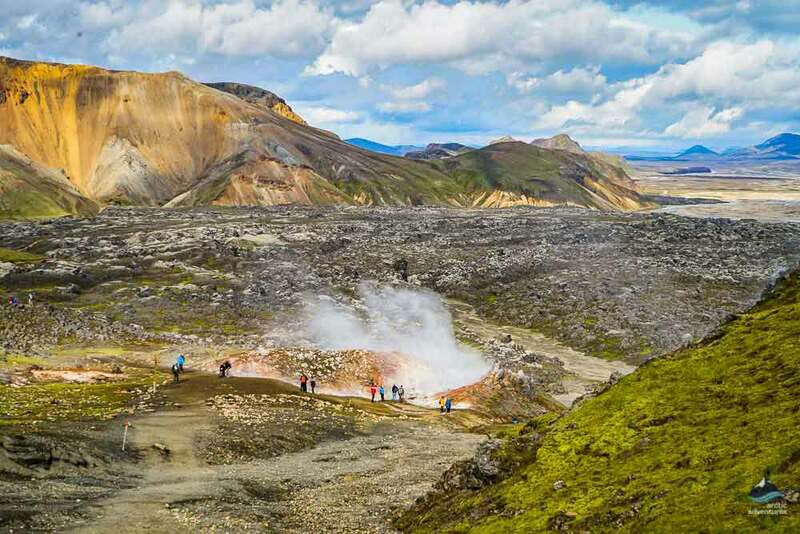 The most famous landmarks inside Landmannalaugar are the mountains Brennisteinsalda and Bláhnjúkur, its natural hot pools and the lava field Laugahraun. 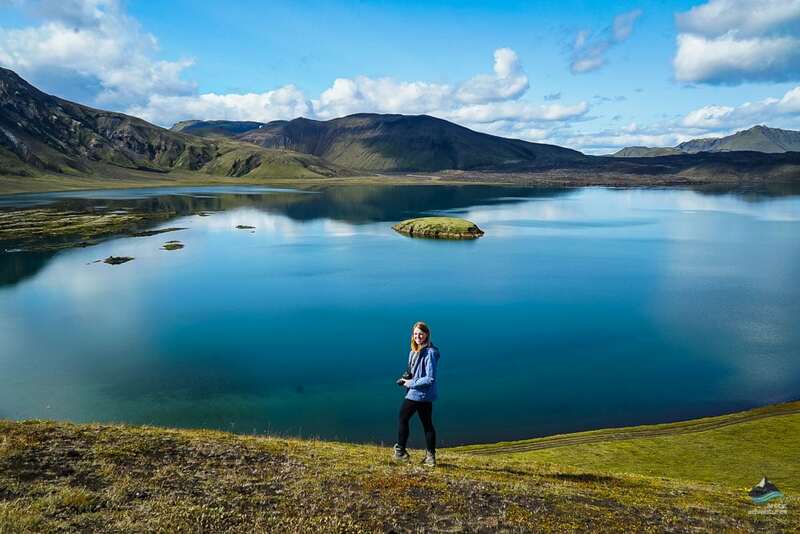 Additional nearby showstoppers are the ironically named Ljótpollur e. Ugly Puddle and the fascinating Lake Frostaðavatn. 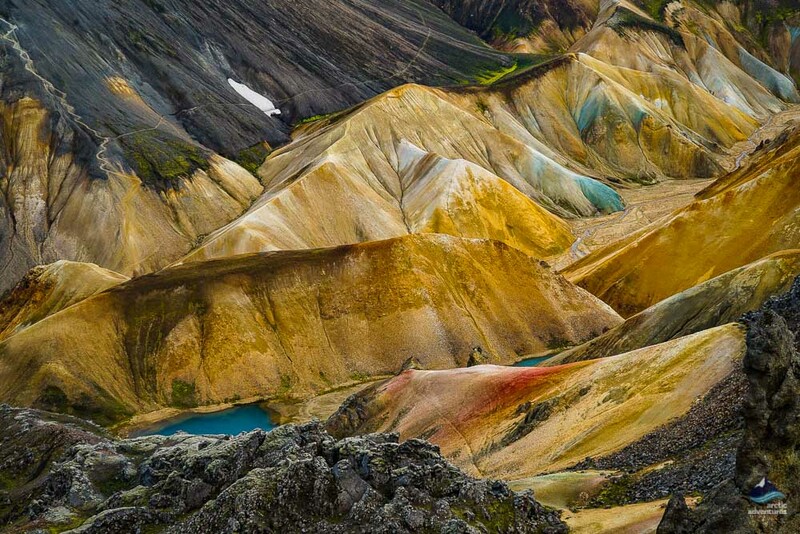 Landmannalaugar is a part of the Torfajökulseldstöð volcanic system which has been active for a very long time. 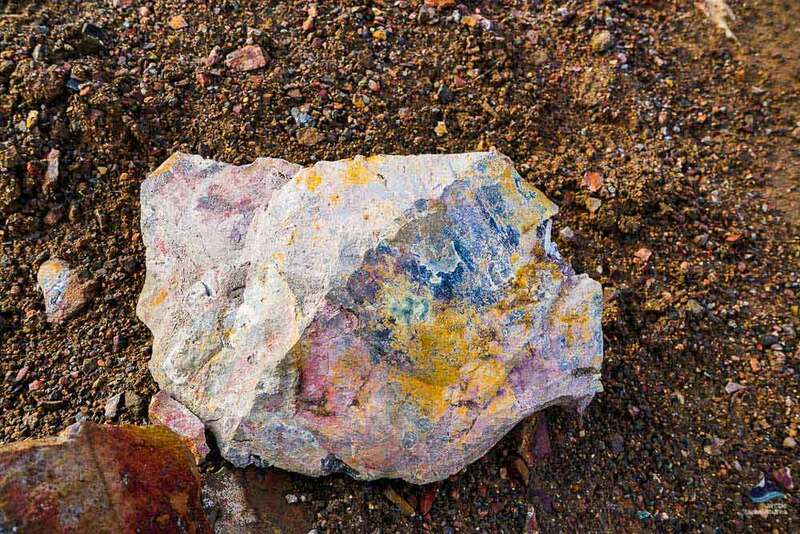 The oldest lava field known to have come from the volcanic system is about 400.000 old but scientist believes the system itself but be up to twice that age. Torfajökull volcano last erupted in the year 1477 sculpting the Landmannalaugar area and creating most of the scenery we see there today and the biggest rhyolite stretch in Iceland. Laugahraun lava field came to be in the eruption of 1477 making it one of the very few rhyolite lava fields to have formed after the land was settled. 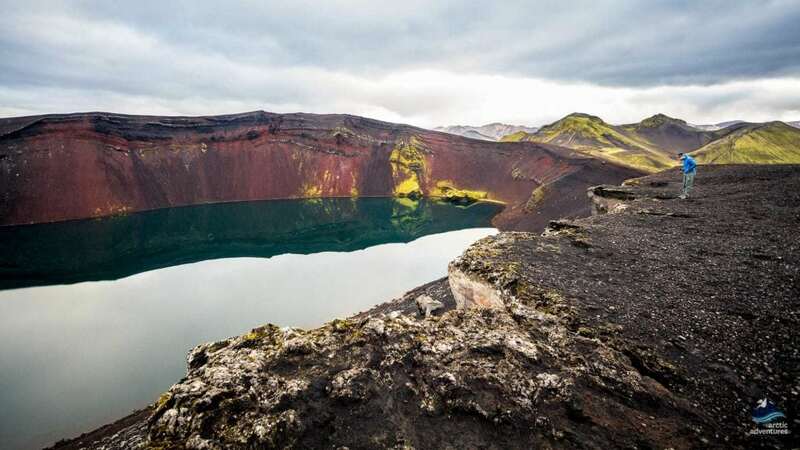 It is a mesmerizing sight to see how the lava must have slowly run its course tightly up against the pastel-colored Brennisteinsalda creating the most stunning contrast. Where the lava field then comes to a stop, a steep pitch black lava wall formed from which hot water now runs filling up the pools we like to soak in while visiting this wonderland. Mt. 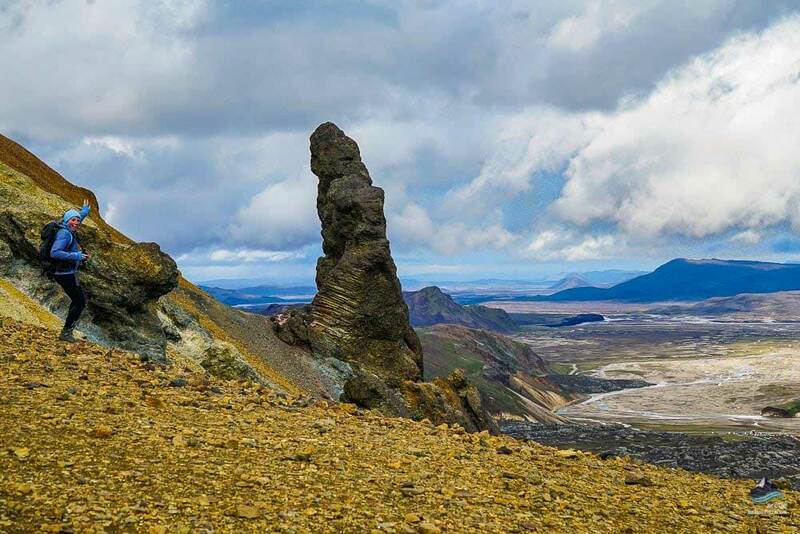 Brennisteinsalda which would translate to Sulphur Wave is a rhyolite mountain that formed in a volcanic eruption under a glacier during the last ice age. 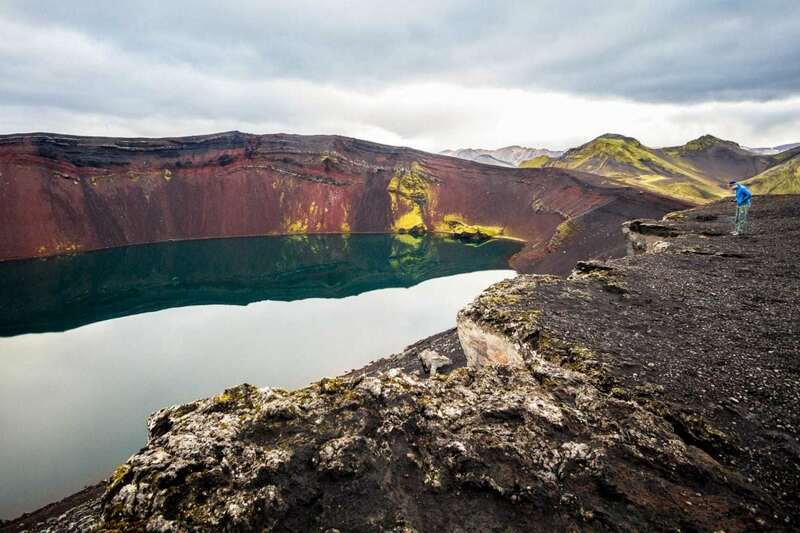 Its last eruption took place in the year 1961. 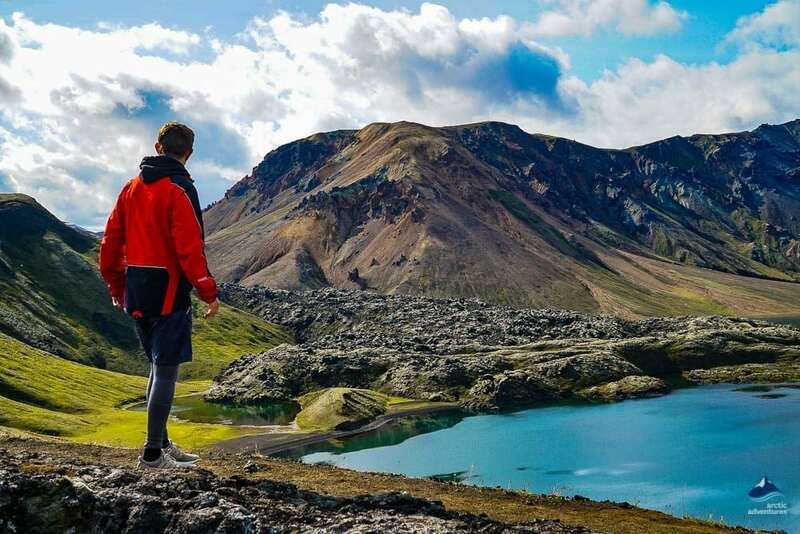 You can easily hike up the mountain for an exquisite view over the whole terrain but hikers starting the Laugavegur hiking trail go the same path. 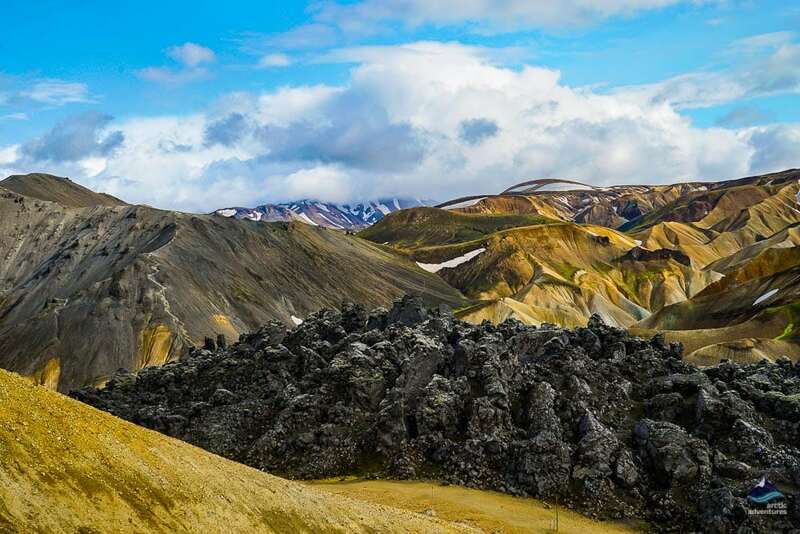 Bláhnjúkur, sometimes spelled Bláhnúkur, is a volcano inside Landmannalaugar. 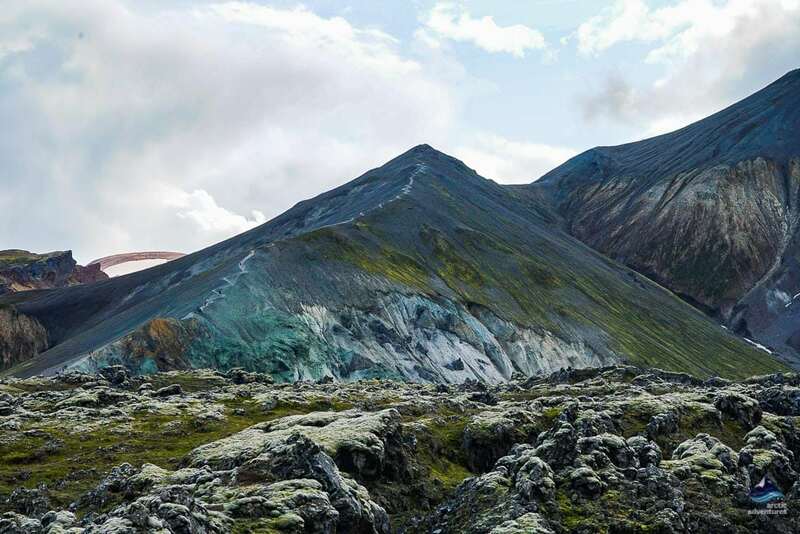 Its name Bláhnúkur would translate Blue Peak and comes from the blue-black hues that throne its slopes. 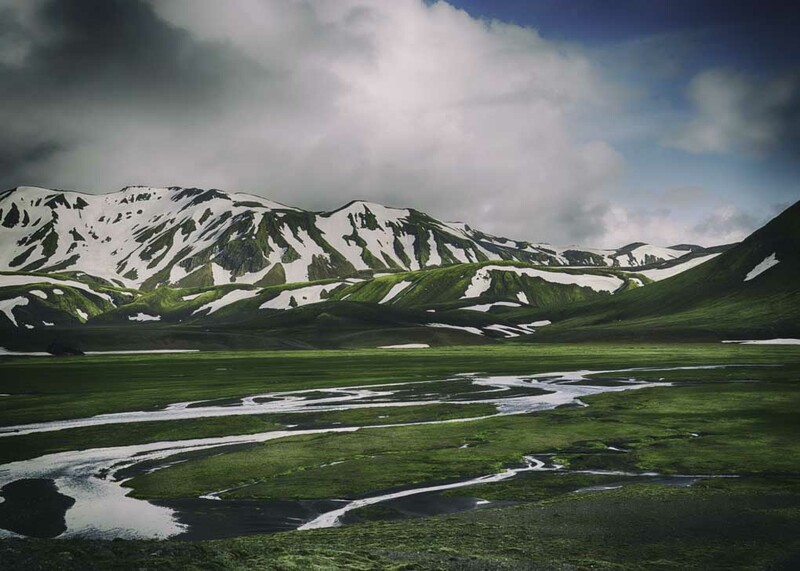 Its highest point is 940 meters (3080 ft) and it is a popular mountain to hike when visiting Landmannalaugar. From the top of the mountain volcano, you can see several glaciers! 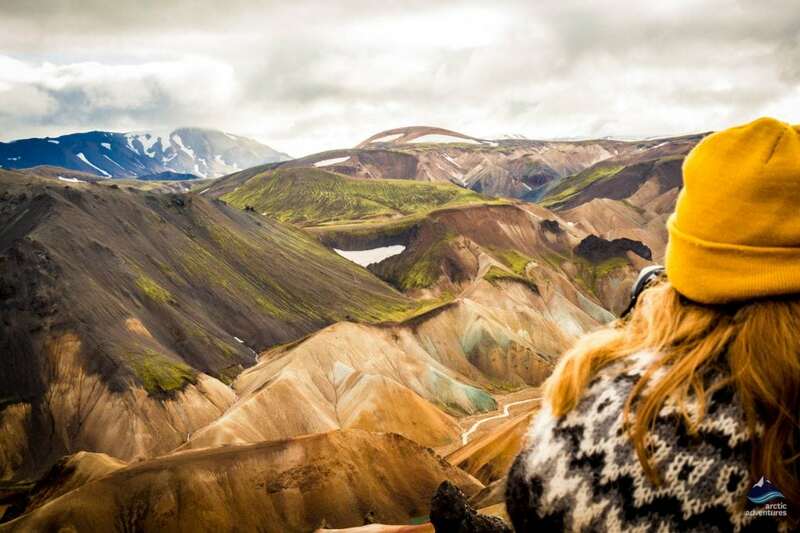 Landmannalaugar is in the Fjallabak Nature Reserve in the Icelandic Highlands 188 km (117 mi) from the capital, Reykjavík. To set the scene other driving distances are from Selfoss at 144 km (89 mi), from Akureyri at 269 km (167 mi) and from Egilsstaðir at 544 km (338 mi). 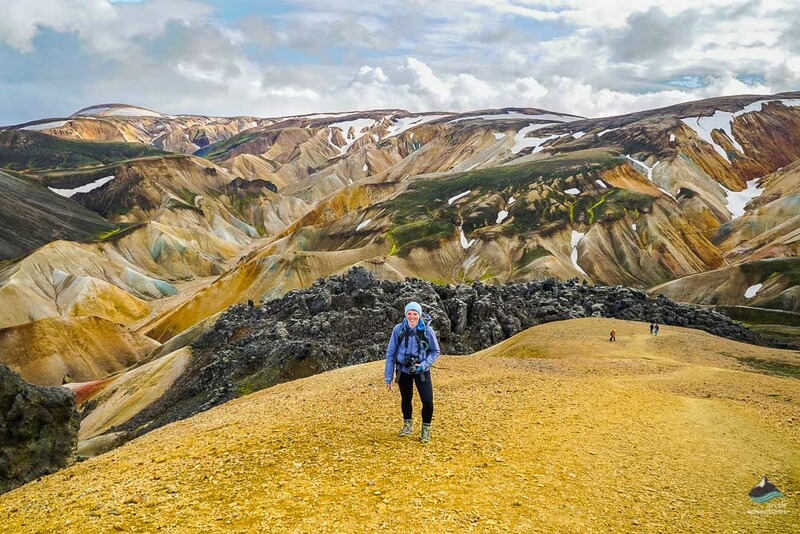 There are a few ways one can go about reaching Landmannalaugar. The most common are joining tours visiting the area, jumping on a scheduled bus going there or to rent a car and drive there on your own. 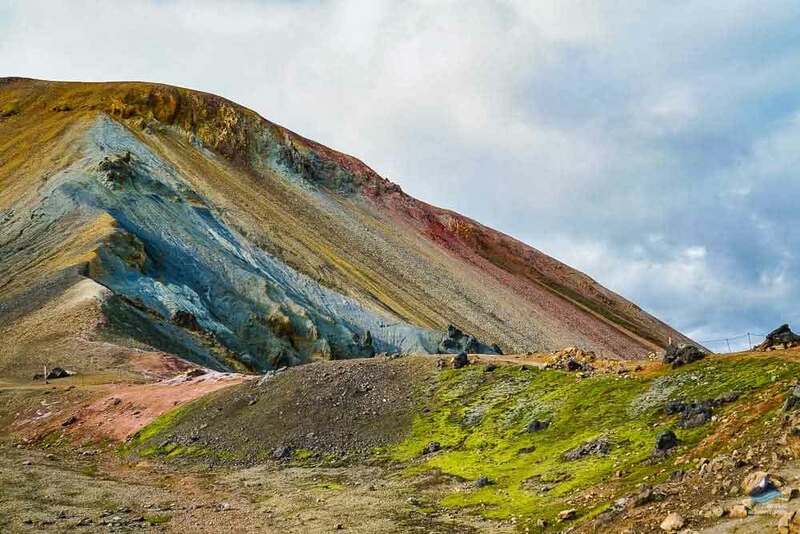 If you decide on the latter it is important to keep in mind that the road leading to Landmannalaugar isn’t paved all the way so you need to make sure you are allowed to drive on F-roads before embarking on a self-drive trip. 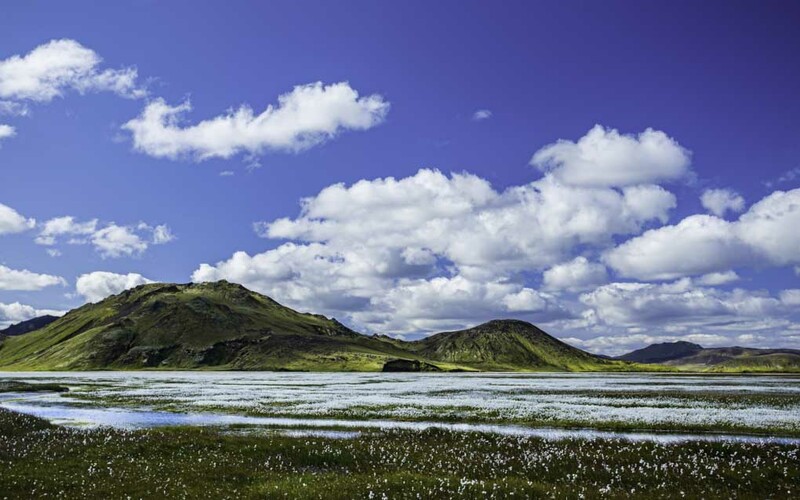 After all, visiting a place in the highlands in Iceland is surely a trip to the wild! 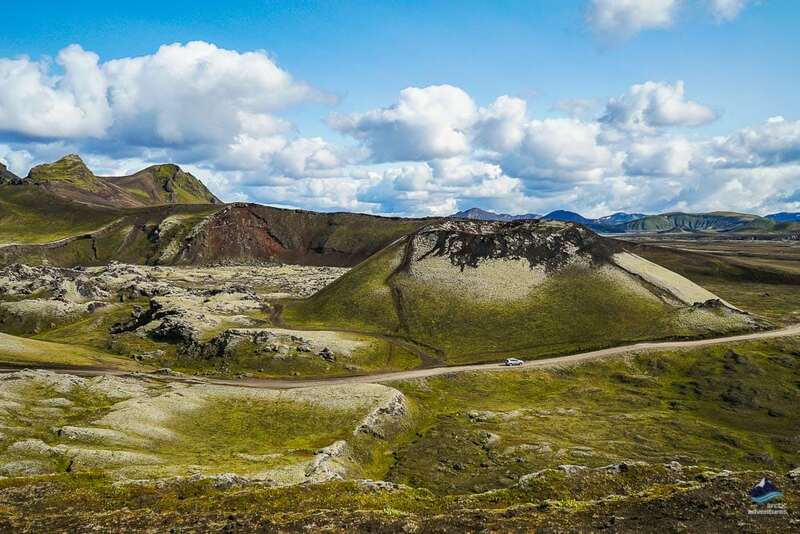 If you are driving from Reykjavík to Landmannalaugar you will begin by following Ring Road one over Hellisheiði heath and through the smoky town on Hveragerði and Selfoss before making a turn off the main road one on to road number 30. This road you follow until you see a sign taking you off it to road number 32. 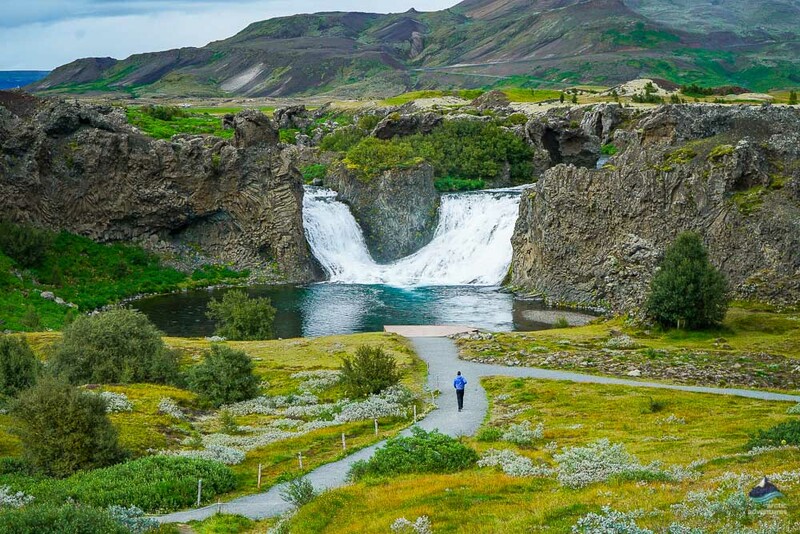 You will follow 32 for a quite a while past Hjálparfoss waterfall and all the way until finding road F26, named Þjórsárdalsvegur which will take you to the Hrauneyjar Highland Center. At this point in time, you need to start to be on the lookout for F208, Fjallabaksleið Nyrðri. 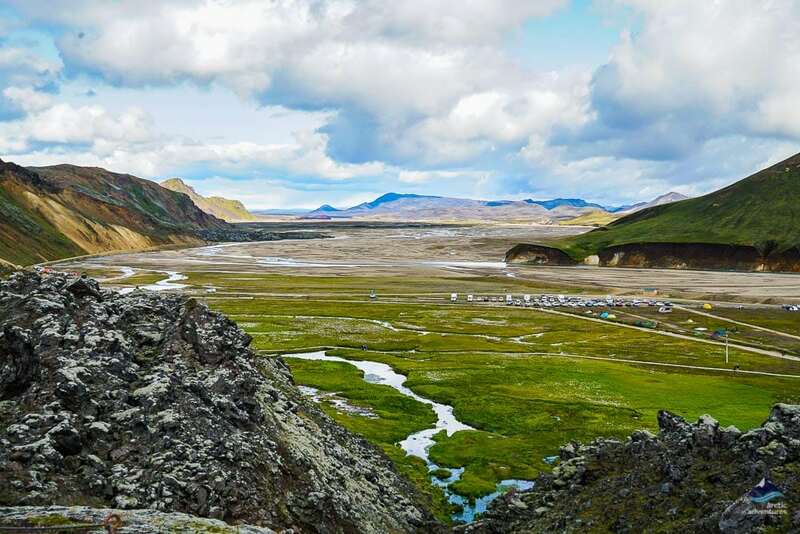 You will need to cross a few rivers in order to reach Landmannalaugar so if you aren’t used to doing so follow the lead of parked cars at the widest river and hike the rest. 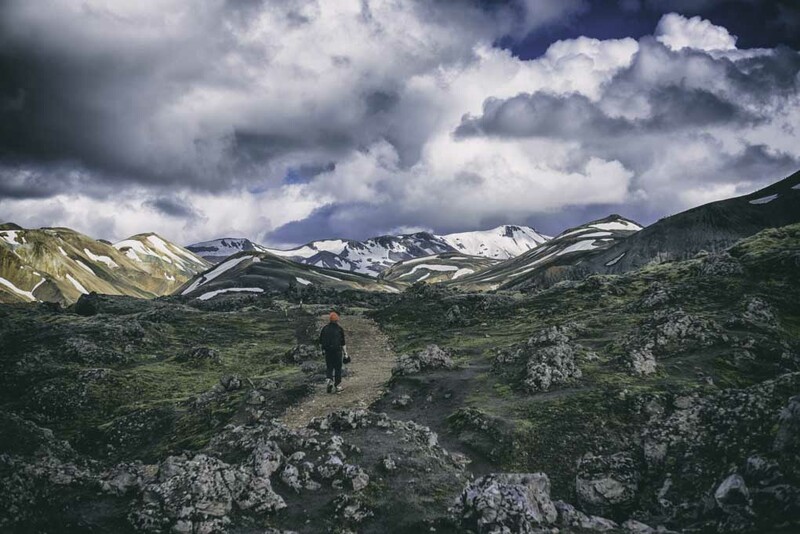 Start of the Laugavegur Trail leading to Þórsmörk, can be done in 4, 6 or 8-day trips with tents or in Highlands Cabins. Hike Mt. 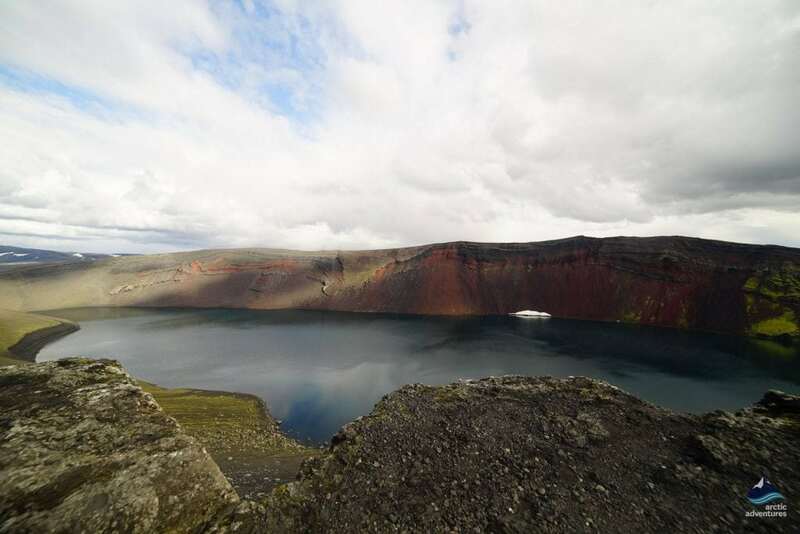 Brennisteinsalda for a beautiful view the colorful terrain, lava field and lakes. Takes about 2-3 hours. Traverse Mt. Bláhnjúkur for a few of five different glaciers on a clear day. Takes about 3-4 hours. 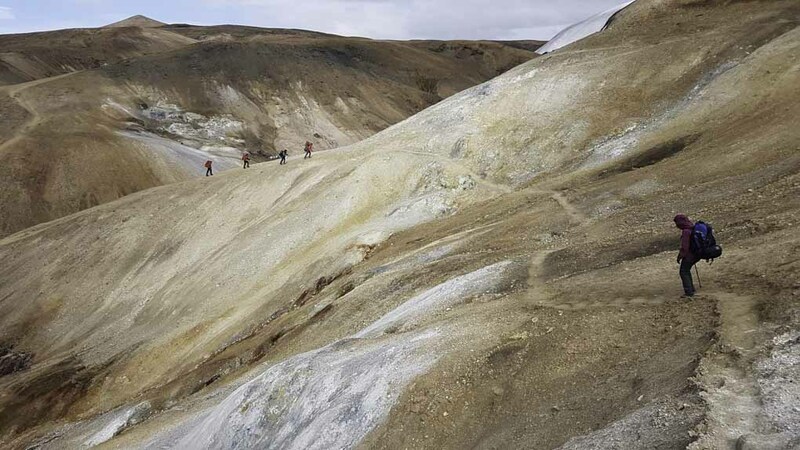 Roam around the lowland across Laugahraun lava field to the bottom of Grænagil e. Green Gully and back to the mountain hut base. Takes about 1-2 hours. Landmannalaugar was originally best known for its geothermal baths, hence the name People’s pools. The area provided both travelers and farm animals shelter and warmth and the baths gave people a chance to fully relax after an immense day of roving. Today the pools serve the same healing source for tired hikers and trekkers who have enjoyed the hike in the windswept mountains. 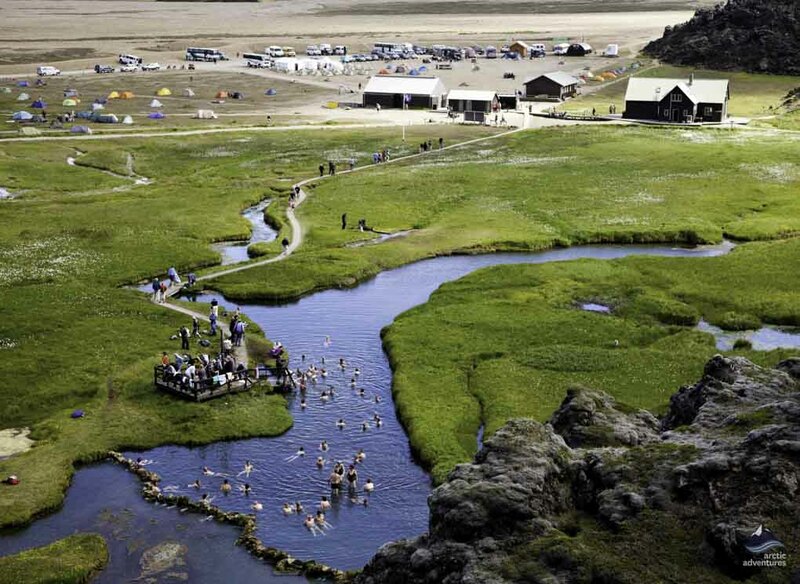 The soothing springs come at no extra cost and act as a price for those to reach Landmannalaugar but you will need to pay for restroom use where many like to change to their bathing suits. You can also wear the suit underneath, comfortable for those who aren’t looking to do extensive hiking before the bath. 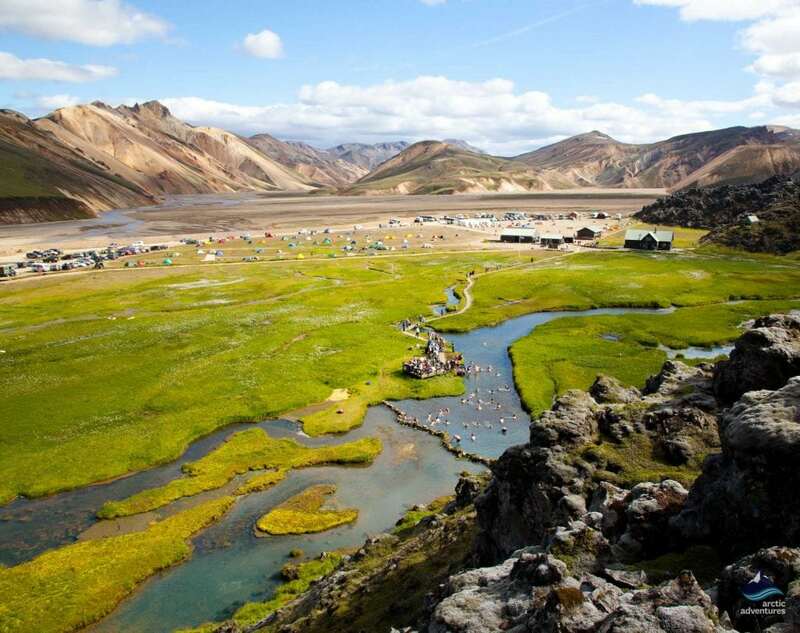 Inside Landmannalaugar you have two options for accommodation: Camping or Mountain Huts. 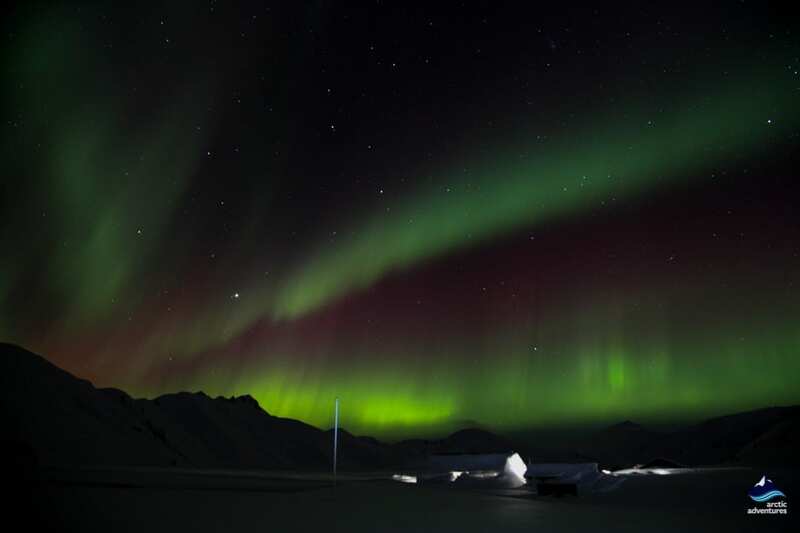 The black hut with the green roof is running by Ferðafélag Íslands and has 78 beds. The hut is big and cozy, has two floors and is open and manned all year round. A night in the hut costs 9000 ISK and you will need to bring your own sleeping bag. 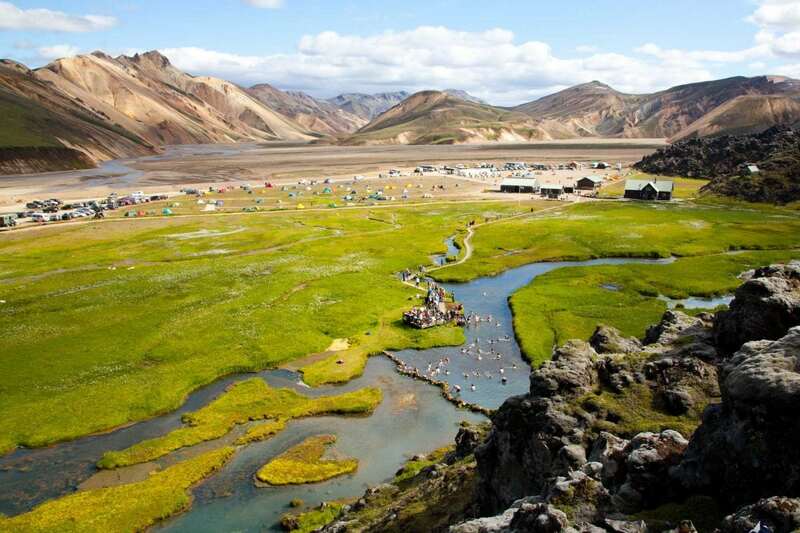 Camping in Landmannalaugar costs 1800 ISK per person and basically gives you access to toilets, running water, a BBQ and cooking facilities. Landmannalaugar is a phenomenal winter paradise. 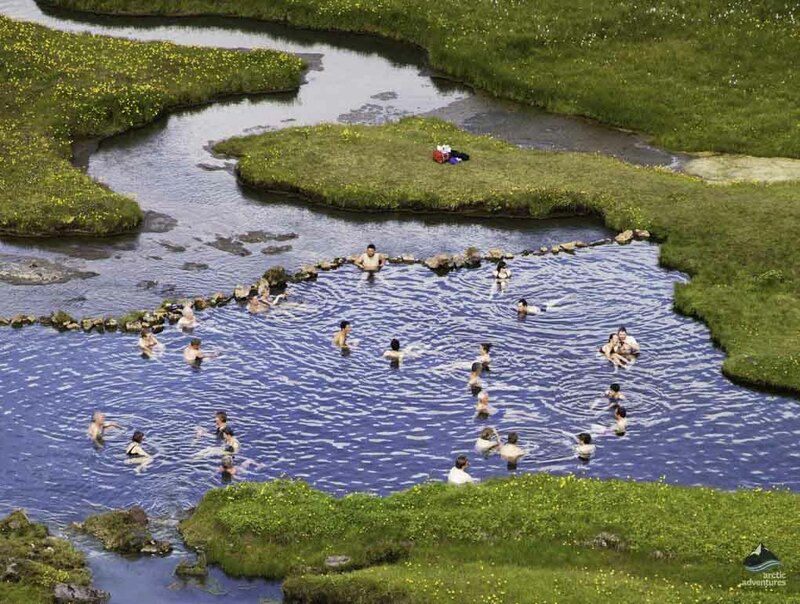 First, it is likely that you will have the grounds almost to yourself, secondly, the Northern Lights are known to shine brighter from Landmannalaugar and last but not least, the hot geothermal pool it still hot enough to bathe in – an experience without comparison! 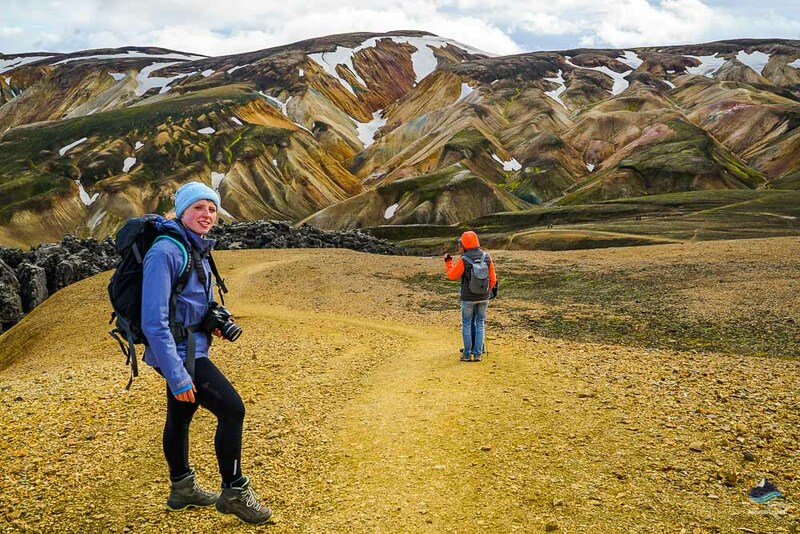 Arctic Adventures offers an excellent 2-day winter tour in Landmannalaugar covering everything there is to see and do in and around this dramatic region.